Spent a week in Vegas earlier this month. In classic stick-in-the-mud form, I spent that time shuttling between a Root Cause Analysis course in the Flamingo conference center and my hotel room in the Westin, catching up on work and attending 5AM conference calls. The showier the waitress, the more blase the food. Shortest skirt was at Yellow Tail, the sushi place at the Bellagio. Even before the outrageous price per piece ($60 for 12-piece chef's selection), this was some of the sloppiest, most tasteless sushi I've eaten. Next up, Le Burger Brasserie, featuring Le Waffle Fries. This was a not-bad tourist burger positively shellacked with a French sheen. $19 gets you a burger. For a side of the afore mentioned extra-french french fries, another $4. On the third night, I made it over to Ceasar's, and found Mesa Grill. My waitress was a perfectly normal person, wearing actual pants. And it was - by far - the best meal I had on the trip. It's a beautiful space (as they all are), but unlike the other two, the minute you walk in, it's clear that it's run as a restaurant. Service was impeccable and crisp. I had a glass of California Syrah that was to die for (custom label for Mesa). 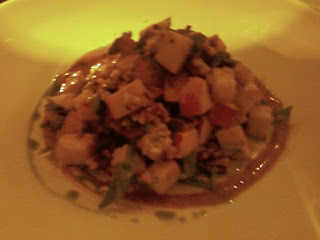 The best thing I ate here, and the best thing I ate on the trip, was a Gala Apple Salad. Primarily this is perfectly crisp chilled cubes of apple, with a few leaves of baby spinach, candied pecans and blue cheese in a chili-orange vinaigrette. Strange combination, beautifully executed. I could have had three of these, skipped the entree, and been a very happy guy. Slightly less impressive, but still tasty was the Pork Tenderloin. Portioned for two, maybe three large people, this was delicately cooked tenderloin in a mild mole sauce. On the side, which was the best thing on the plate, was a sweet potato tamale. 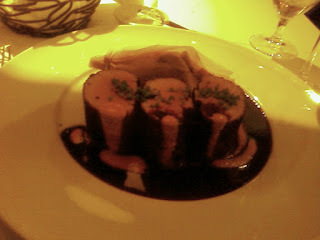 The mole was a bit on the bland side, though beautifully presented, but the tamale was heavenly. All that being said, Vegas was truly a ball. 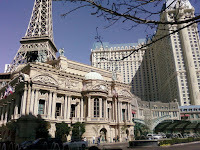 Just walking down the strip is an education of what the human race can build given the raw ambition, unconstrained by anything. Eating mediocre there is still a good time. But through all the overscaled hugeness of the place, the food there is a subtle reminder that good food is made one plate at a time, by people who know what they're doing, regardless of the glitz around them. Thanks Susan! Grubbus has suffered from some neglect over the last 6 months, but I'm totally jazzed about getting it rolling again. Awesome post, Eli! Also, how tasteless is the name Yellow Tail for a sushi restaurant in Las Vegas. Can I assume all of the waitresses were Asian. I swear, Vegas was created by frat boys, for frat boys. Have you seen this recipe from Bobby Flay for a salad that sounds very similar to the one you loved at Mesa Grill?